IS FLOSSING A PART of your child’s oral hygiene routine? Daily flossing is just as important for a child’s dental health as it is for an adult’s. As parents, you play a major role in helping your children learn to floss correctly and understand its importance from a young age. Flossing should begin as soon as your child has two teeth that touch. By starting regular flossing early, your child will get used to the daily task and will be more likely to incorporate it into their own oral healthcare routine later in life. As flossing requires a certain amount of manual dexterity, children will need parents’ help and supervision until about age 10 or 11. Unfortunately, because baby teeth eventually fall out, many parents underestimate their importance and may neglect flossing. Even though they are temporary, baby teeth are essential to a child’s growth and development. They aid in chewing, promote proper speech development and reserve a space for permanent teeth to grow in. Daily flossing will keep your child’s smile healthy and protect it from tooth decay! Waxed floss: If your child’s teeth fit tightly together or are more crowded, waxed floss is for you. It is generally thinner and easier to glide between tighter-fitting teeth. Dental tape: This is a wider, flatter type of floss that is designed to be gentle on exposed gums. If your child has gaps in their teeth, we recommend using dental tape. Ultra Floss: Some children have varied spacing between their teeth. Ultra floss is wide enough to comfortably clean between gaps but can also stretch thin enough to clean between teeth that are close together. Floss threader: Orthodontic appliances such as braces can make flossing extra difficult. The floss threader is designed to get into the nooks and crannies between teeth and around braces. Pre-threaded Floss Pick: Many parents report that floss picks are easier to use on their children because of the convenient handle. They often come in different colors and can be fun for a child to pick out for themselves and be more involved. No matter which floss you choose, the most important thing is to floss your child’s teeth on a daily basis! Call us or come into our office to discuss which type of floss may be best for your child. 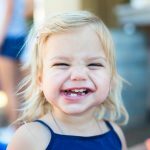 We will teach you how to floss your child’s teeth correctly as well as provide tips to make it easier. When you don’t floss your child’s teeth, you miss cleaning 35 percentof tooth surfaces in their mouth. Flossing completes brushing by cleaning the hard-to-reach spaces between teeth that a toothbrush can’t. By brushing and flossing your child’s teeth on a daily basis, you ensure that their smile stays cavity-free and help put them on the path of good oral hygiene for a lifetime!